Natracare Organic Cotton Tampons - Super Plus (non applicator) are a natural, non-toxic choice for those times when your menstrual flow is quite heavy. Developed as a direct response to health and environmental concerns about dioxin pollution caused by chlorine bleaching, Natracare tampons are made from pesticide-free organic cotton and do not contain rayon and other synthetics, known for causing irritation. In fact, Natracare created the world's first certified organic tampon. Dioxin, a toxic carcinogen, is a by-product of all chlorine bleaching methods and also found throughout the environment in varying levels as a by-product of pesticide spraying and pollution from incinerators. Studies show dioxin collects in the fatty tissues of animals, including humans and should, therefore, be a real concern for women. Evidence is mounting that even low levels of dioxins may be linked to cancer, endometriosis, low sperm counts and immune system suppression. The presence of dioxins in traditional tampons is of concern for women when you consider how many tampons they may use in a lifetime. Why should you use Natracare Organic Cotton Tampons? 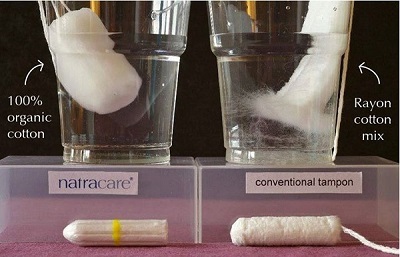 In additional to the above, conventional tampons do not hold their shape when exposed to liquid for a length of time (see comparison image below). This is even more worrying when you consider the contents of the tampon. Insert the tampon using your index finger - tuck it into the red flared end of the tampon - to enable the tampon to be pushed into place. After use, you can easily remove the tampon using the organic cotton withdrawal cord. Want to know what may be in your traditional, non-organic tampons? Find out more in our article - Secret Women's Business. Disclaimer: Naturally Safe Cosmetics are not health professionals. Any information or advice in this product description is of a general nature only and based on the manufacturer's published information. It is not intended to diagnose, treat, cure or prevent any disease. For medical advice regarding your own personal circumstances, we recommend you contact your GP or other healthcare professional.